José Raúl Capablanca (19 November 1888 – 8 March 1942) “was a Cuban chess player who was world chess champion from 1921 to 1927. One of the greatest players of all time, he was renowned for his exceptional endgame skill and speed of play. Due to his achievements in the chess world, mastery over the board and his relatively simple style of play he was nicknamed the ‘Human Chess Machine'” (source: Wikipedia). Know for his elegant endgame theory and play, he is Aaron’s favourite player and one of the main inspirations for this project. Find more of his games, downloadable as PGN files at http://www.chessgames.com. 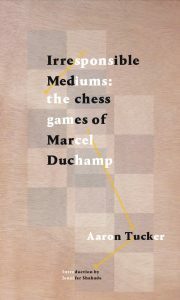 Marcel Duchamp (28 July 1887 – 2 October 1968) was one of the leading thinkers and artists of the 20th century that acknowledged a great debt to (and at times obsession with) chess, eventually achieving the rank of chess master. “In 1918, Duchamp took leave of the New York art scene, interrupting his work on the Large Glass, and went to Buenos Aires, where he remained for nine months and often played chess. 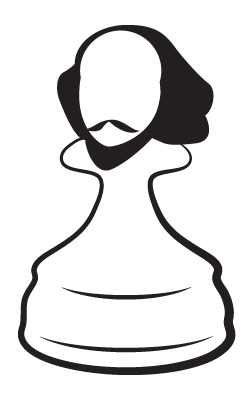 He carved from wood his own chess set, with the assistance of a local craftsman who made the knights. He moved to Paris in 1919, and then back to the United States in 1920. Upon his return to Paris in 1923, Duchamp was, in essence, no longer a practicing artist. Instead, his main interest was chess, which he studied for the rest of his life to the exclusion of most other activities” (Source: Wikipedia). His works, writing and interviews, in particular the notion of the ready-made and his translation puns, were essential to this project. Find more of his games, downloadable as PGN files at http://www.chessgames.com. The Turk was in fact a mechanical illusion that allowed a human chess master hiding inside to operate the machine. With a skilled operator, the Turk won most of the games played during its demonstrations around Europe and the Americas for nearly 84 years, playing and defeating many challengers including statesmen such as Napoleon Bonaparte and Benjamin Franklin. The operator(s) within the mechanism during Kempelen’s original tour remains a mystery. When the device was later purchased in 1804 and exhibited by Johann Nepomuk Mälzel, the chess masters who secretly operated it included Johann Allgaier, Boncourt, Aaron Alexandre, William Lewis, Jacques Mouret, and William Schlumberger. Find more of its games, downloadable as PGN files at http://www.chessgames.com. Vera Menchik (16 February 1906 – 27 June 1944) “was a British-Czech chess player who gained renown as the world’s first women’s chess champion. She also competed in chess tournaments with some of the world’s leading male chess masters, defeating many of them, including future World Champion Max Euwe.” (Source: Wikipedia. Find more of her games, downloadable as PGN files, at http://www.chessgames.com. Deep Blue was a chess-playing computer developed by IBM. On May 11, 1997, the machine, with human intervention between games, won the second six-game match against world champion Garry Kasparov, two to one, with three draws. Kasparov accused IBM of cheating and demanded a rematch. IBM refused and retired Deep Blue. Kasparov had beaten a previous version of Deep Blue in 1996. Find more of its games, downloadable as PGN files at http://www.chessgames.com. It was named after Deep Thought, a fictional computer in Douglas Adams’ series, The Hitchhiker’s Guide to the Galaxy. The naming of chess computers has continued in this vein with Deep Blue, Deep Fritz, Deep Junior, etc. Find more of its games, downloadable as PGN files at http://www.chessgames.com.